Mark and Sue Schalk started Two Branch Ranch when they were looking to return to the farm life. Sue explains, "We started small with three alpacas, one English Angora rabbit and a handful of chickens." Today, the farm is home to quite a few more animals. "We've focused mainly on the alpacas and over the past few years have grown to a herd of twenty-one animals with five pregnant females due this spring." Sue spends her time on the farm hand-spinning, weaving and processing the alpaca fiber to create finished goods which the couple sells at their local farmers' market, fiber fairs and online. In the past, the Schalks were feeding a mix of pasture grasses, an alpaca supplement and free choice minerals. Sue says, "We have a few acres here where we grow hay to feed to our animals and in the past this was sufficient. Over the years our herd has grown significantly and then the drought hit hard last summer. We only harvested about a third of the hay we normally do and were faced with trying to find good hay to get us through the winter. In our area, there's a lot of hay for cows but not grass hay for alpacas. The drought made it increasingly hard to find decent hay. 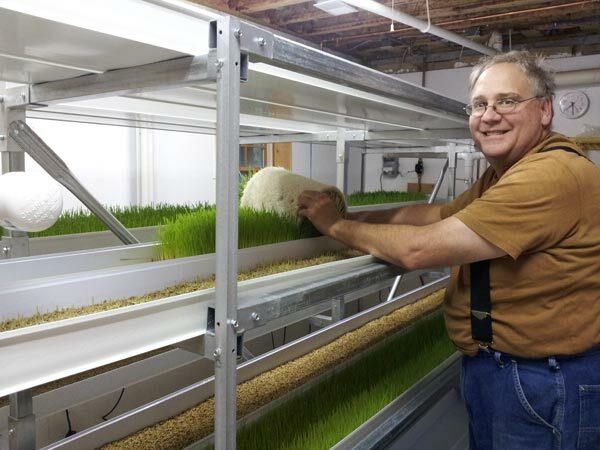 We had heard about feeding barley grass and began to do some research." The Schalks did quite a bit of investigating online to try to find the perfect system. Sue explains, "Many of the systems were too big for us. After learning about the different FodderPro 2.0 Feed Systems from FarmTek, the Schalks were sold on the Mini model. "It was small enough for us to put in our basement where we had the right temperature and access to water. The nice thing is that we can easily expand on the system if necessary." Feeding fodder has been beneficial for the Schalks. Says Sue, "The system is working out fantastic! We are happy with the harvest we get and that it doesn't take much time to maintain. We are planting 9 lbs. of seed per 12' tray and are harvesting an average of 65 lbs. of barley grass each day." The animals are very pleased, too. She continues, "We haven't sheared the alpacas yet, but their fiber appears very healthy—it is thick, long and has a nice shine to it. 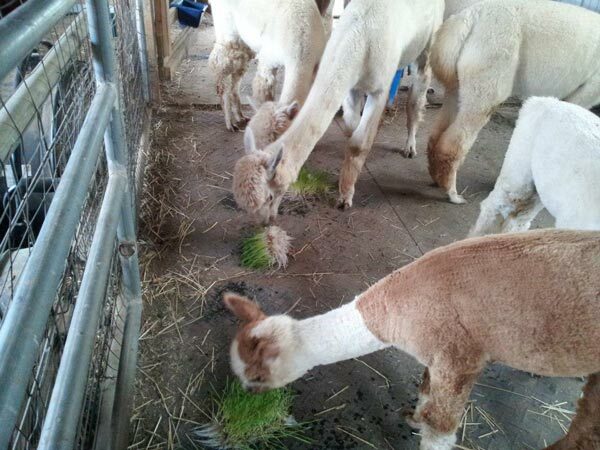 Everyone is very healthy, energetic and they love the barley grass. I like that the animals stay hydrated over the winter from eating the barley. 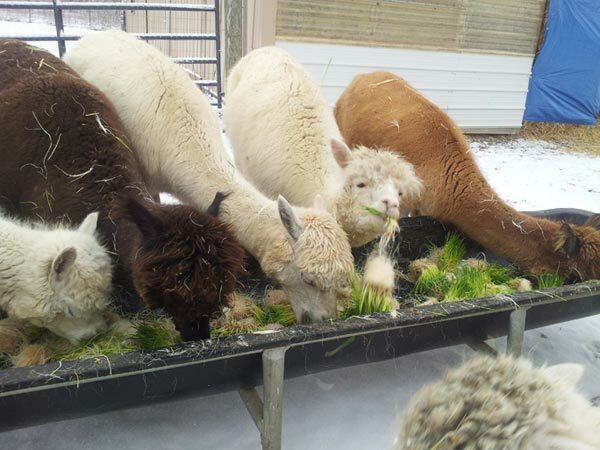 We initially bought the system just for the alpacas, but our rabbit and chickens love it too!" Since buying the fodder system, the Schalks are seeing a savings in feed costs. Sue explains, "Because of the drought this year, we would have had to purchase a lot of top-quality hay at very high prices. Since we are able to feed barley grass, we could get by with lesser quality hay which costs less. This winter, we probably saved $1,500 to $2,500 on hay costs. When asked what advice Sue had for others looking at fodder systems, she answered, "Buy it from FarmTek! There are several options to choose from to fit your needs. The kit makes it easy and has taken all the guess work out of trying to build your own system. The cost is about the same considering all the time you will waste trying to do it yourself. Their customer service is excellent. They are available to answer your questions and help you be successful with your system." She adds, "If I had to do it over again, the only thing I would do differently is buy the fodder system sooner!" Due to drought, the Schalks hay crop yielded only a third of what they had harvested in previous seasons. Instead of buying the expensive hay they needed, the Schalks decided to purchase a Standard Mini FodderPro 2.0 Feed System and grow the feed themselves. They are saving thousands of dollars in feed costs and their alpaca have never been happier or healthier. Love your fodder system? Let us know!